at the counter top, not my usual spot by the window. More like lifestyle shots, rather than my usual side-lit editorial stylie. It’s different and I think I like it. and how, to me, they’re (and this may sound weird if you’ve never styled food) so utterly honest. I know the pancakes aren’t beautiful, but they’re honest too, if that makes sense. Cakey and soft, but also hearty and slightly bumpy. Enough batter to make a nice tall stack of pancakes, enough to linger over. and healthy enough to not make me feel sluggish and hungry for the rest of the day. Stir together all the dry ingredients in a small bowl. Add in the rest of the ingredients and any add ins. Mix well. Spray a non-stick skillet with oil, spoon 2 tbsp of batter into the pan, and spread into a circle. 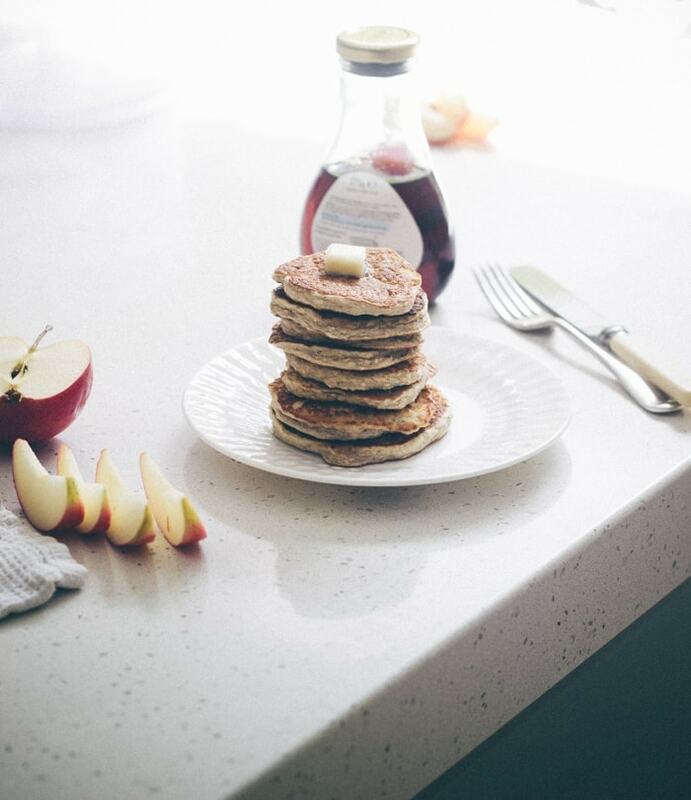 Golden rule with pancakes: cook them low and slow – i.e. low heat for a few minutes on each side. Stack them high, and eat with plenty of maple syrup. 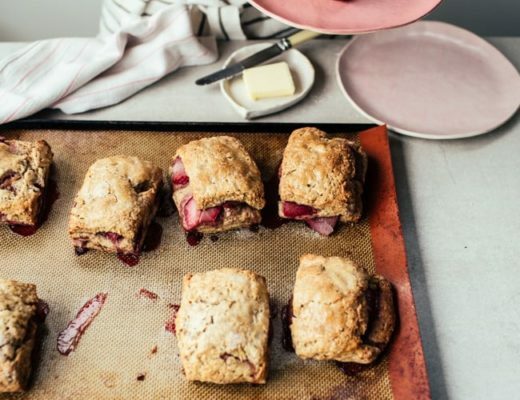 This looks delightful…I could happily wake up to these in the morning with a few strawberries too! I love these photos…they seem much more accessible if you get what I mean. I love the kind of shoots where the food is just how it would be were it in front of you right now. 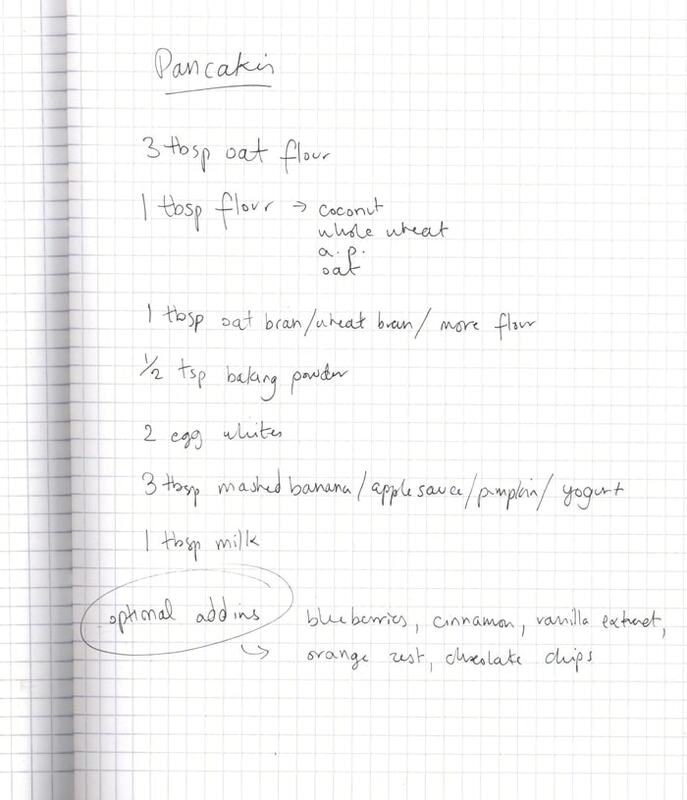 Definitely going to give this pancake recipe a try. I ike your new style. And it sounds so much faster 🙂 I like this simplicity and pancakes as well. YES pancakes for breaky are the way forward! Super healthy and keep you filled up til lunch and beyond! What you say about honesty really appeals to me – the food pictures that I’m drawn to are the ones that are honest rather than presenting a hyper-styled version of life. I want to be able to sit down and eat what’s in the photograph in front of me, not worry that I’m going to knock some artfully placed crumbs onto the floor. More power to you. OK so your honest photos are still 10 bajillion times better than mine would be… *pancake batter in my hair, on the floor, on my cat, on the window… what? 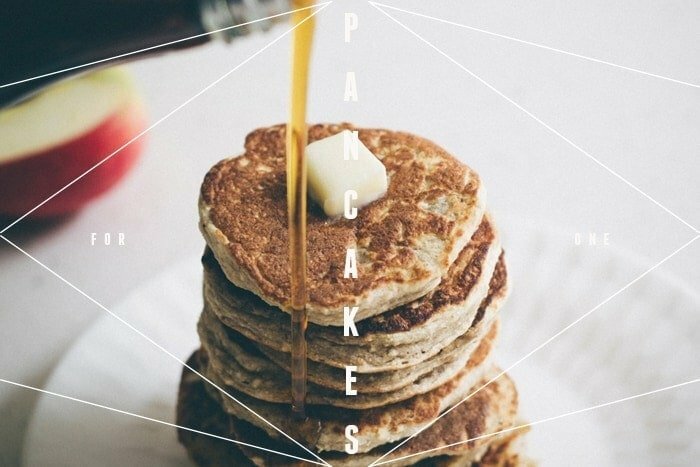 but seriously* and they make pancakes look like little breakfast patties of heaven. But I love your approach to this. Yay for (beautiful) honest pancakes! You take the BEST pictures!!! I’m in awe every time. Haha I always shoot at my kitchen counter (I’m lazy like that) so I completely know how you feel. I also love the honest shots. beautiful! You’re speaking my pancake language. Love! Yea gurl. You go with those lifestyle photos! I love ’em. I can imagine you set a place for me to help you out with a twin stack of delicious pancakes 🙂 I love all your small batch recipes! They’re so perfect for my lifestyle and plus I love pancakes so this is just yay. I absolutely adore this style of photos! You’re right.. they are way more honest! And I also think it’s really nice for you since you don’t have to make that big of a time effort compared to the ones you make usually.. If you know what I wanna say ;D The recipe sounds very good and it’s nice that it’s the amount for one person! I need to give them a go! thanks Erika! yep, I love me some single serving recipes!! Collecting them now for when I go to uni and will be cooking for myself a lot more! And now I want pancakes for dinner. And yeah! So honest! And honestly good-lookin’! Quality work as always. The light in your photos is so wonderful, the scene is ripe for pancake eating. Your photos are so gorgeous ! 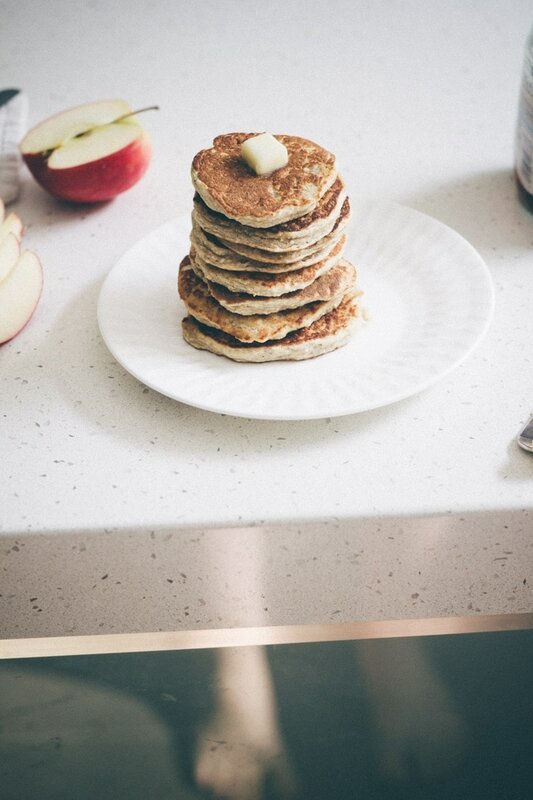 I love the natural light… these pancakes sound just perfect ! thanks Rosemary! I always try to stop myself over-propping photos, it can totally detract from the food! these look amazing, i need to face plant those stat! so fluffy and moist. and how are they not pretty these are the most damn gorgeous things i have ever seen! I love this natural styling, and, of course, the idea of pancakes for one. So comforting and simple, and so satisfying. Love the pictures! I’m a totally making these tomorrow! These pancakes would definitely be for one because I would eat the whole gorgeous stack. Oh, those are my kind of pancakes, 100%! I think they look beautiful, and hearty and nutty and home-thrown together for just that kind of morning with a stiff cup of coffee and a lot of fun work to do. I was wondering if I should whisk the egg whites before adding them.. Thanks! A bit late to the party here, but I was wondering if rolled oats blitzed in a food processor would work instead of the oat flour. And then would 4 tablespoons of rolled oats = 4 tablespoons of oat flour? I live alone and am gluten free, so when I found this, it was a god send! Oat flour is one of the really easy to get flours where I’m living so the fact that this called for it made it the beeest! I put in chocolate chips and cinnamon and vanilla and they were better than any pancakes I’d ever had! Best breakfast ever! Thanks for the recipe! Great pancakes! According to my calculations, the whole recipe has 14 grams of protein and they taste delicious. Your photos always manage to come out beautiful, no matter which way you style and take them! If I wanted to put in oil, what would I substitute out? 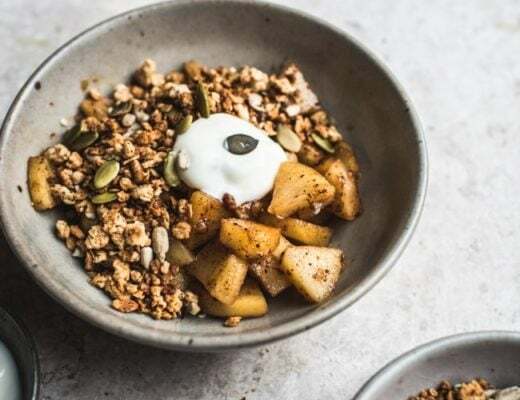 The yogurt/applesauce/banana ingredient? Hi Izy, do you think I could substitue the egg whites with some chia seeds egg? Thank you, Lucia. really not sure about replacing the egg white! I know that the chia will bind the pancake batter but the pancake might be too dense with the chia. It’s great seeing your fast photos. I adored your old stuff, but they are editorial and must have taken ages. But as a starter in food photography myself, it’s good to see these quicker photos as a contrast. Sweeping away props and styling, they seem more honest and as most of us find we photograph when we have limited resources of props and light. Glad you love UNI.